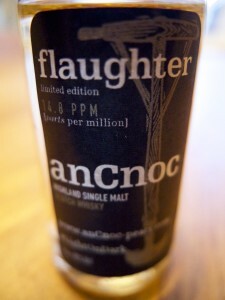 Peaty whisky from anCnoc? 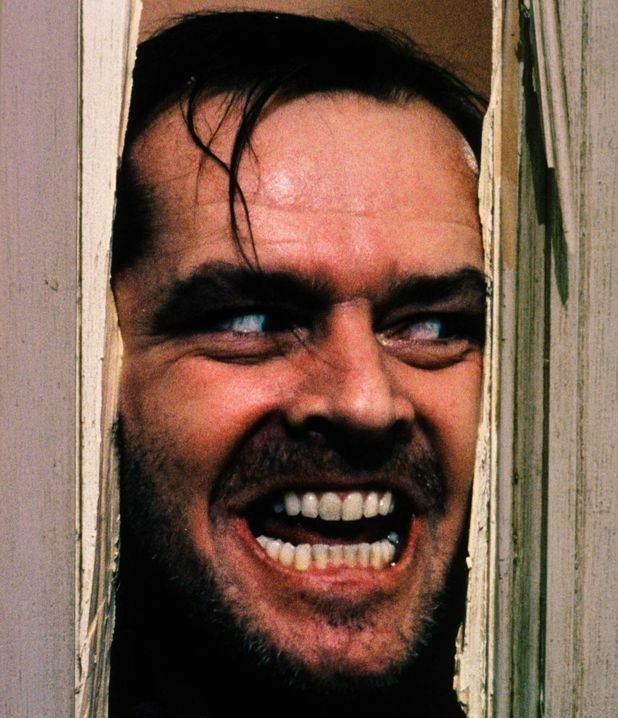 The announcement came through too early to be an April fool so we assumed that it must be a ‘thing’. And that made us very interested. We’re both big fans of peaty whisky and have been over to the island that makes peaty whisky like no other several times, and indeed will be going later this year to do the Half Marathon, but that’s a story for another day. 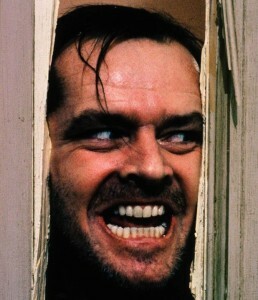 A different kind of shining. Wonder if he likes peaty whisky? 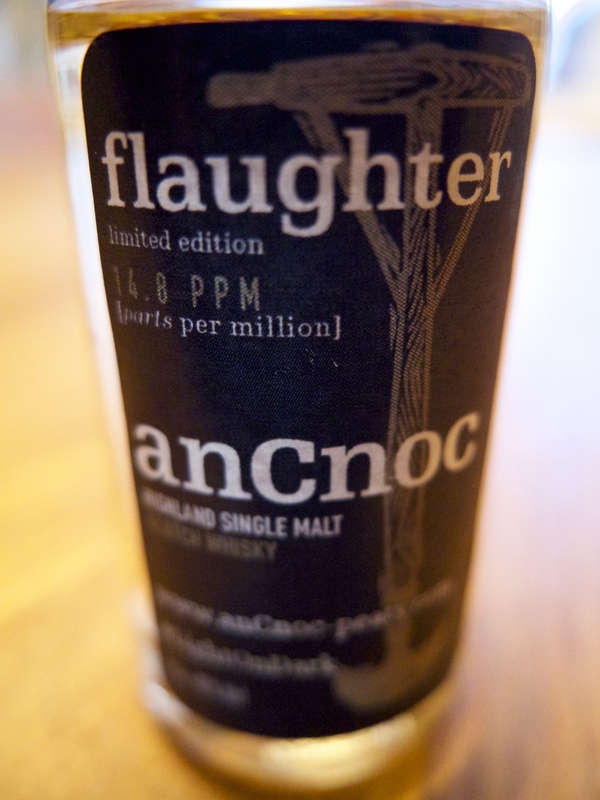 Turning back to the whiskies we find that anCnoc have released three expressions in this initial batch of peatiness; rutter and flaughter for general release, and tushkar as a Swedish exclusive. All three whiskies are named after peat cutting tools which is designed to give an indication of the peatiness of each expression. The least peated whisky in the range at 11ppm. This whisky was matured in ex-American Oak bourbon casks. The rutter spade sizes and separates the cut peat blocks producing a slow buring turf without the massive peat reek that is usually expeccted from Southern Islay whiskies. Nose: Very interesting. Bags of cinnamon covered apples with some sea salt and a hint of sweet smoke. It turns floral and tropical with a good amount of pineapple, before becoming really meaty with a touch of Christmas ham. Peatier than expected, and this is mixed with some buttery shortbread topped with a little lemon zest and vanilla. Lovely. Palate: Soft, with plenty of apples wrapped in pastry and sprinkled with fennel leaves. There is a touch of heat and pistachio entwined with the gentle smoke. The anCnoc spirit still comes through and shines through the gentle peat. Finish: Drying and savoury with a little smoke at the end. Nose: Different to rutter. It is full of brown sugar, oranges and is more floral. Despite the heavier peating the smoke seems more introverted and only really comes across in the form of a mild Lapsang Souchong tea. It benefits from time in the glass with citrus developing after about 20 minutes in the glass. Palate: Very sugary reminding me of Jelly Tots. An oily and earthy dram with the peat becoming more prounced over time. Reminds me of toffee cake and clotted cream. Finish: Longer than rutter, and full of apple skins. The peatiest dram in this initial range at 15ppm. Sadly this whisky is a Swedish exclusive which means that you either need to take a trip, or know a nice Swedish person who can bring you one to the UK! The tushkar is a long spade for reaching deeper into the peat bog to extract more compressed peat that burns slowly. 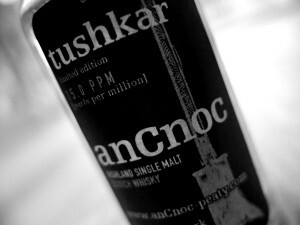 Nose: A real departure from the other two whiskies – it is spicier, full of liqourice and fruit salad sweets. There is a touch of smoke which is complimented by tropical and citrus notes, as well as pear drops. 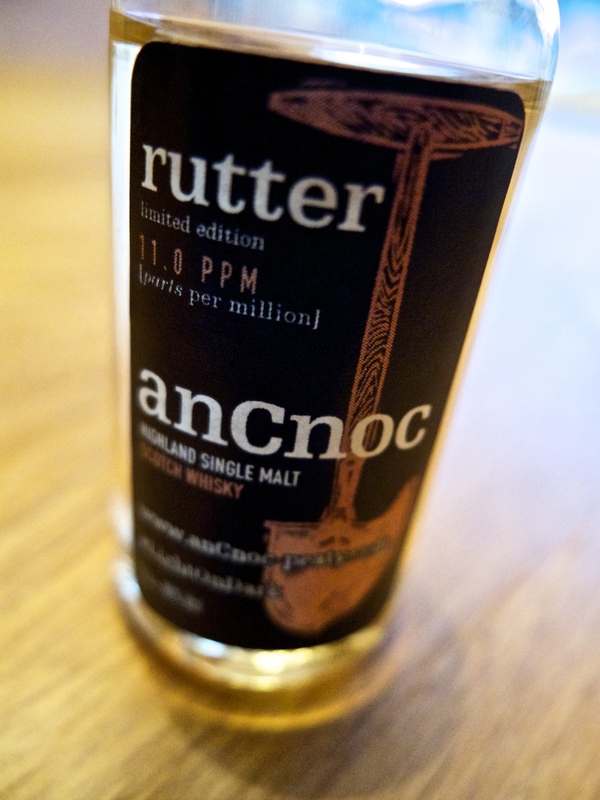 We were really surprised by the range as a whole, and I was even more amazed that the lightly peated rutter was my favourite of the three. I loved the interaction of the smoke on the anCnoc spirit and I think what made it for me was the fact that you could still taste the anCnoc characteristics in the whisky. I think thats the point of the whisky, and why I’d buy it. If you want massive amounts of iodine and medicinal notes then you’ll go to Islay; if you want a cracking malt, one where you can still identify the Highland origin, the vanillas and lemons, and fancy a dusting of smoke and peat then come to anCnoc – I guarantee that in this range you’ll find something you like, and there is no better place than to start with rutter before working your way up to buying a ticket to Malmo so you can try tushkar – annoyingly my second favourite. See you on the flight!